I haven't written a Favourites post in ages, so I figured that since it is almost the end of April, I should recap all of my favourite things from this month! I absolutely LOVE this product! I have tried a number of different dry shampoos but I have to say that this is my favourite one. I really like this dry shampoo because firstly, it doesn't leave any white residue - the powder is pretty much transparent- , secondly, it adds heaps of volume to limp or flat hair, and thirdly, it smells amazing! The coconut scent immediately transports me to a tropical location and effectively masks the smell of oily hair. I have been using this product all month, even if I just washed my hair because the volume that it creates is phenomenal. 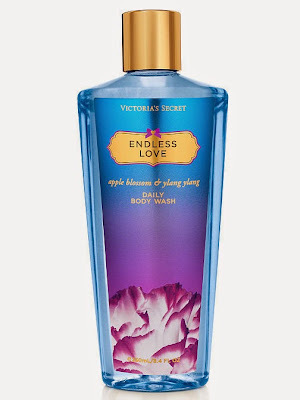 I have been loving the Endless Love scent from Victoria's Secret. I own the body wash and body lotion and I use them together every day. This is one of my favourite scents from Victoria's Secret (I also love Secret Charm and Such a Flirt), because of its gorgeous fruity and floral notes. The Victoria's Secret body washes are great as they foam up really easily and they have a large range of delicious smelling scents that leave your body smelling amazing! I have been absolutely loving this book series! I finished the first book, Reason to Breathe in a week and have almost finished the second book, Barely Breathing, which has also taken me a week. There is one more book in the series called Out of Breath and I am anticipating to start that next week. Considering that there are over 500 pages in each book, they are such great reads! My favourite book series ever is The Summer I Turned Pretty Series by Jenny Han which is also a trilogy (I read all 3 books in one week - however, there were only about 200-300 pages per book), and I have to say that the Breathing Series is high up there with this series if not equally my favourite. The story follows a teenage girl named Emma who tries to lead a normal life, even though her life at home is quite dysfunctional. She is very independent and only has one friend, but when she finds love, it changes everything. You really get to see her character grow and develop and you actually feel like you are her. I cried multiple times throughout the story and felt joy when she felt joy. This is such a great book series and I would recommend it to anyone! I hope you enjoyed reading about my April Favourites! What are your favourite things this month?